As seen posted on the front wall of the Dynasty Inn Hotel in Bangkok. Signs like this always make me chuckle. Any other travel destination in the world you might see signs like ” no shoes, no shirt, no service” or ” no smoking”. It’s always nice to know the hotel’s stand on pachyderms! 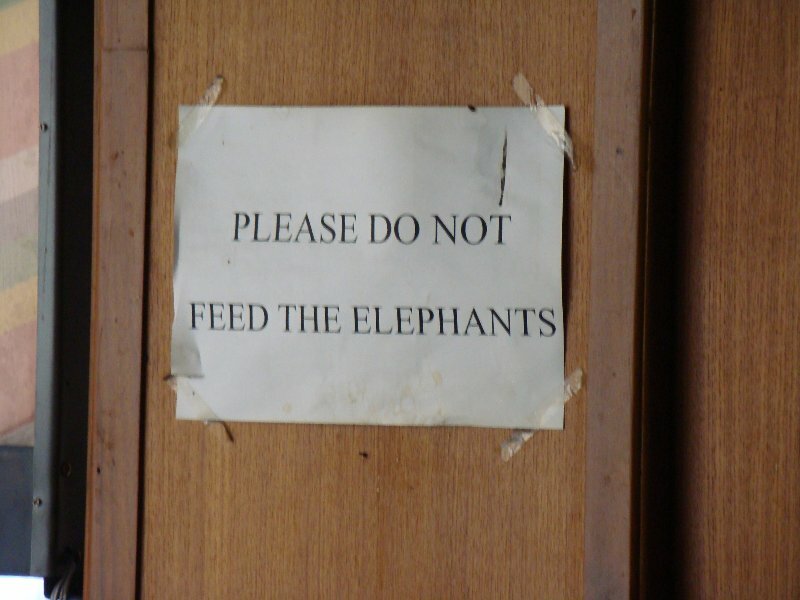 More hotels around the world should weigh in on the subject because you never know when you might have the urge to feed an elephant. Although the sign looks funny there is a very real problem of Thai’s walking around Bangkok with their elephants hawking them to the tourists by selling them food to feed to the elephants. It’s very sad to see the elphants in the big city like that when they belong in their natural habitat. If you find yourself in Bangkok try to resist the urge and maybe these elephants will find their way back to where they belong when the owners realize they aren’t making money anymore. I know, wishful thinking…but if more people understand the problem maybe things will change one day. Talen, one of my pet subjects (no pun intended). It is always sad to see elephants in the big city or indeed being used in other places as tourist transport. Thai mahouts also use an evil spike to hit the beast with which I never saw in India for example. Some of my favourite elephant watching has been in Africa where generally speaking they remain where they should be, in National Parks, in a wild state but available to be observed by tourists. Everyones happy, the guides make money, the tourists get close to wild animals and importantly the animals live naturally most of the time. Think they’ve put a halt (or say they have) to elephants in Bangkok over the last few days, after that recent road accident. Three warnings, then a massive (by Thai mahout standards) fine. I also read that they government was offering mahouts a large sum of money if they hand over their elephant, something like a million or a couple of million baht? In some women’s bathrooms you’ll find signs that say, ‘don’t stand on the toilets’. I’d be following behind a well-dressed lass only to find muddy shoe prints on the toilet tops. How they can balance in heels, I’ll never know. I really hope they are offering money to the mahouts and they stop using elephants. I’ve seen spikes used at some of the big Thailand attractions as well as in the street. Not a pretty sight.